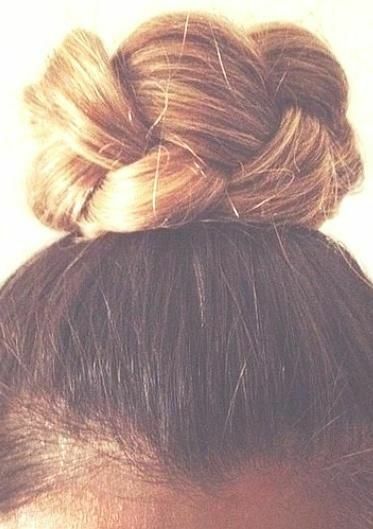 There are plenty of ways you can do your hair, but none of them is as popular as making a cute bun! In the following paragraphs, we will introduce you to some of the simplest ways to make your hair look gorgeous! Enjoy! To create this gorgeous look, start by making a messy high bun, using only one hair band. Take two big strands of hair from the front, making sure they’re not looking too neat. Pull each of them back and through the hair band. Secure them with bobby pins, and finish with a layer of hairspray. This is one of the easiest hairstyles, but it also looks very cute when done properly. Start by making a ponytail, but without putting on the hair band. While holding it with one of your hands, use the other to wrap the hair band around and around until you’ve created the perfect top knot. There will be times when you’ll want to spice it up a bit, and a braided top knot is the perfect hairstyle for just such occasions. To start, make a high ponytail, and braid the hair, securing the loose ends with a hair band. Wrap the braid around the base of the ponytail and finishing by securing it with bobby pins. This gorgeous hairstyle can be completed in a matter of minutes. You’ll need to make a ponytail and pull it through a hair donut, securing the bun in place with a head band. Next, split the hair that’s sticking out in two halves, making a braid out of each one. Wrap them around the bun and voila! You’ve got yourself a braid-wrapped bun. This hairstyle is not only elegant, but easy to do as well. Start by separating a strand of hair from both the top and one of the sides of your head. Make a low ponytail out of the rest of your hair and twist it around, securing it with bobby pins. Wrap each of the remaining strands around the low bun and you’re done! 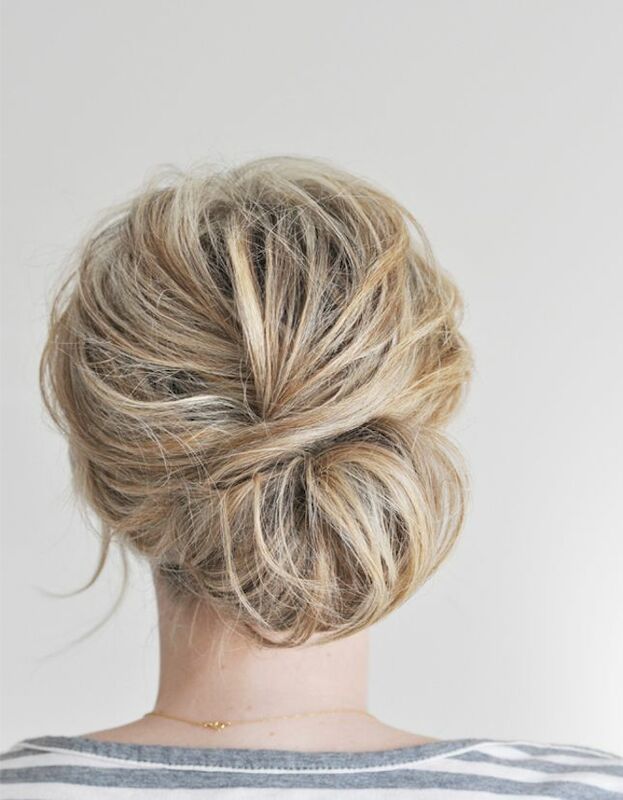 To make a chignon bun, first you’ll need to separate your hair in two big strands. Twist the beginning of each one and secure them together just below the part where they’ve been twisted. As a finishing step, take the loose ends and tuck them into the space between the strands. This hairstyle is perfect for achieving both a cute and a glamorous look. To make it, grab the ends of your hair and wrap them around your index finger. Keep rolling them until they’ve all been pressed against your head. Secure the hair by using bobby pins and spray with your favorite hairspray. 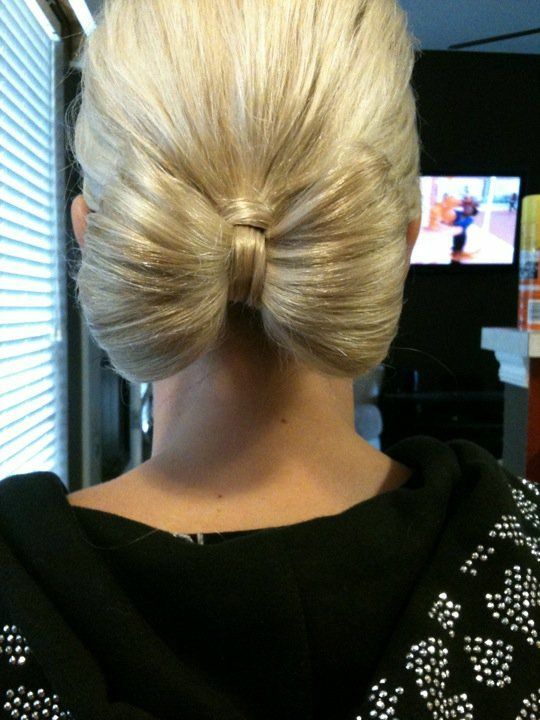 A ballerina bun is one of the most popular hairstyles, and with good reason. To make it, start by tying your hair into a ponytail. Split the hair in two parts and twist the first one to until you’ve reached its end. Wrap it around the remaining part of the ponytail and secure in place. Repeat with the other strand and finish by adding some hairspray. To create this lovely look, simply make a part at the back of your hair. Once this is done, knot them just like you would do with your shoelaces. Repeat that once more and hide the loose ends under the knot itself using bobby pins. To finish, spray your hair so there aren’t any loose strands. 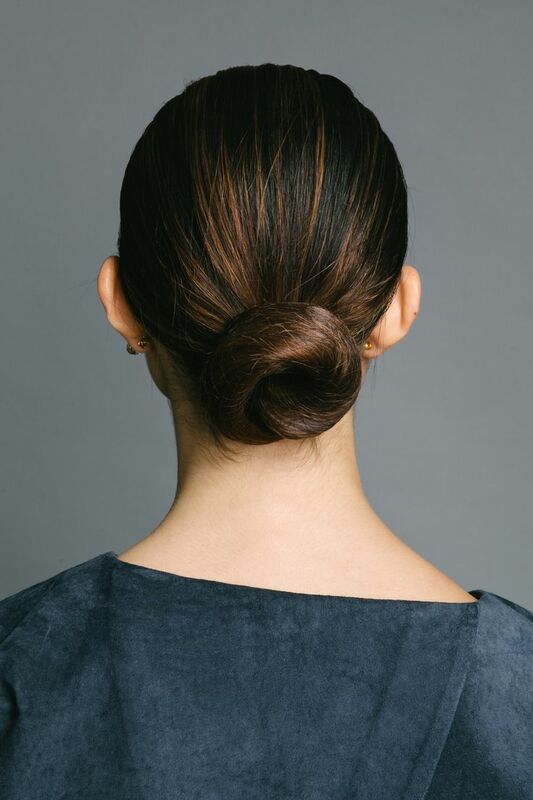 A low rolled bun is a variant of the chignon, and just as easy to do! Make a low ponytail and separate the hair above the hair band in two halves. Twist them around a bit and pull from below to make them tighter. Grab the loose hair and pull it over the hair band, repeating until you’ve made a neat roll. Another variant of a classic hairstyle, the messy chignon is the perfect choice for those looking to spice it up a bit. To make it, just follow the instructions for the chignon, but before you do that, make sure to tease your hair and use hair products to mess it up a bit. What makes this hairstyle so great is the fact that it looks extremely elegant, but can be done in a matter of seconds. To do it, start by making a low ponytail, but make sure it’s not too tight. 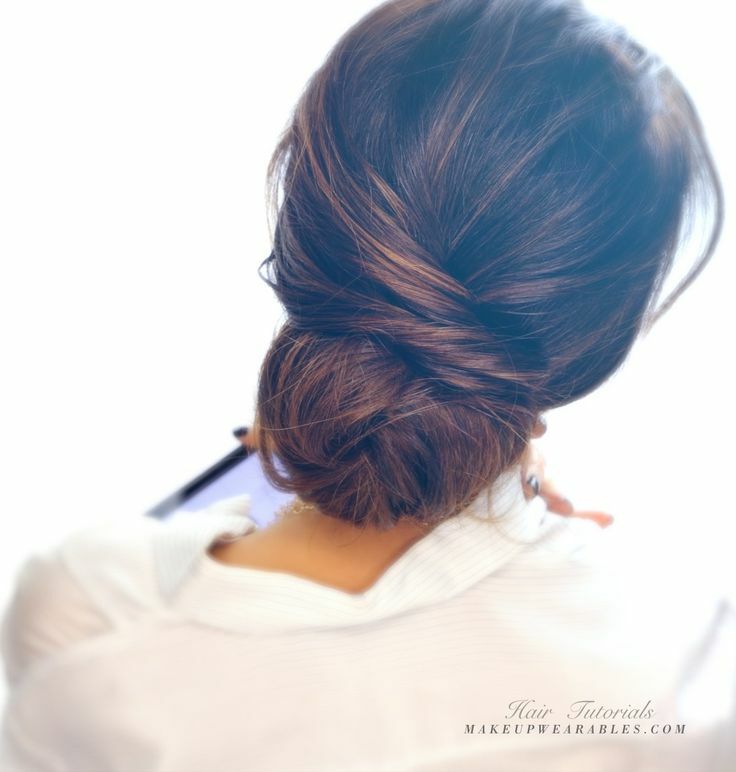 Proceed by wrapping the hair around its base and tucking the loose strands under the bun. Doing a low knot bun is as simple as tying your shoelaces! Just make a low ponytail, separate the hair in two halves, and tie them in a knot. Tuck the rest of the hair under the bun and secure with pins. If you’re getting tired of making the top knot, try making it more interesting! To do a braided knot bun, the only thing you need to do is make a high ponytail, braid two separate braids, tie them in a knot and wrap around the base of the ponytail. Although it looks complicated, this one is actually pretty easy to do. Start by making a ponytail, but so that some of the hair is sticking out. Wrap it around the base and continue by pulling down parts of your hair and securing them with pins. To create this stunning look, start by separating a strand of hair from the side and tying a low ponytail. Take the ends of the hair and flip them over, pulling them through the hair band in order to create a sort of bun. Next, use the remaining strand to finish the “tie”. The donut bun is one of the most loved hairstyles, but for those looking to spice it up a bit, it can be combined with an elegant center part. For the extra special occasions, you might want to do this variant of the layered top knot. To make the bun, just follow the instructions above, and separate a strand of hair that you will use to add the finishing touch. 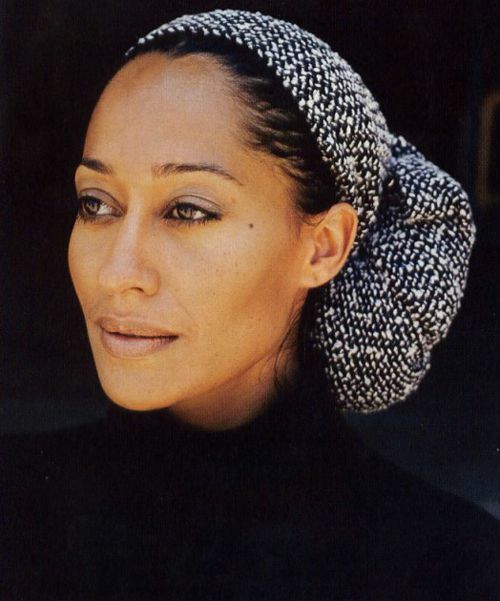 For a more youthful and casual look, try combining the donut bun with your favorite scarf. 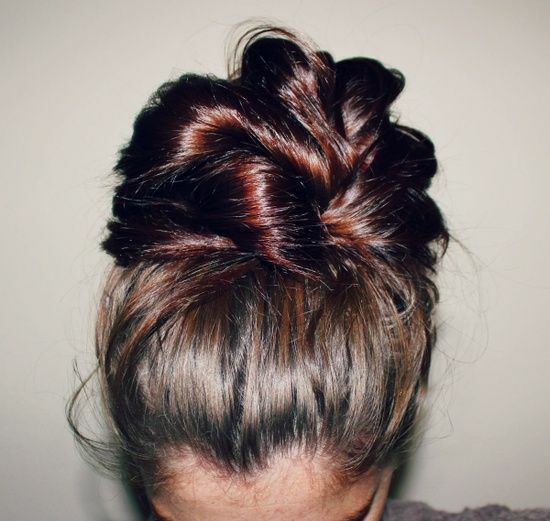 Just tie it around the bun after the hairstyle is done and you’ll be ready to sweep them off their feet! 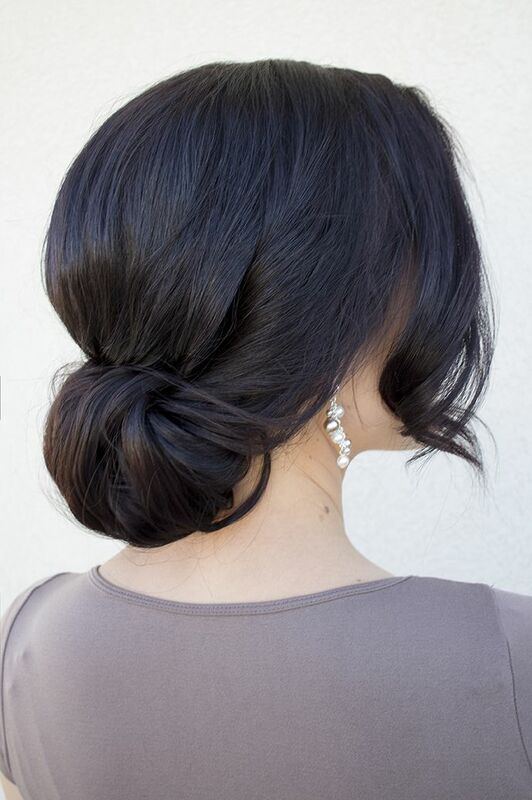 To create this gorgeous look, first you’ll need to follow the instructions for the low bun. 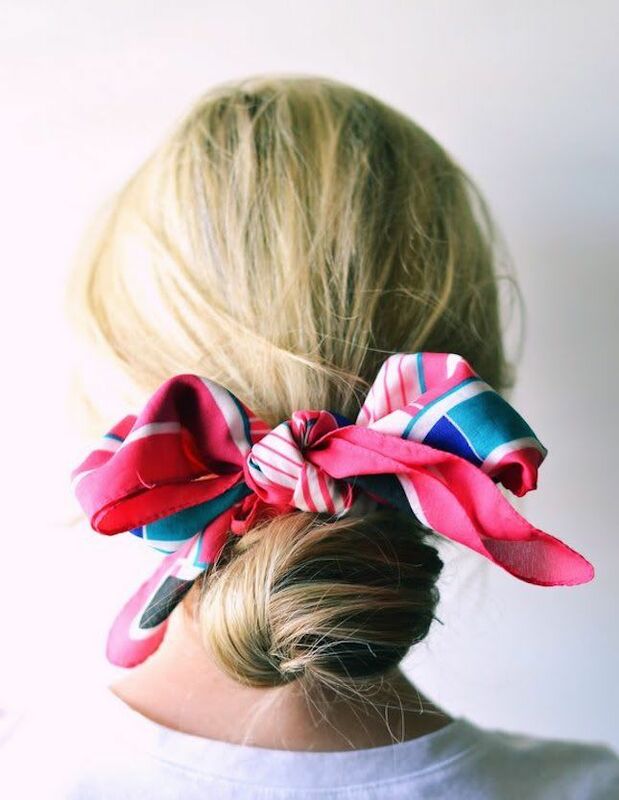 After that part is finished, use a colorful scarf to tie a simple, but lovely bow around your hair, and you’re done! This hairstyle will surely knock your friends off their feet! To create it, start by making a high ponytail, but leave one of the front strands loose. Separate the hair in two halves and fold each to make the bow, securing the loose ends so they don’t stick out. Finish by taking the remaining strand and wrapping it around the middle of the bow. To create a more elegant look, simply follow the instructions for the bow bun, but make it so it’s placed on the back of your head. For this unique hairstyle, you’ll need to make a donut bun, but make sure to leave one of the strands out as you’re doing it. After the bun is finished, take the loose strand and follow the instructions for the bow bun in order to add this gorgeous little detail. Although it looks rather complicated, this hairstyle actually combines two very simple things: the donut bun and the fish tail braid. To make it, do the fish tail starting from the bottom of your head, and tie the loose ends into a donut bun. Add a cute bow and you’re done! 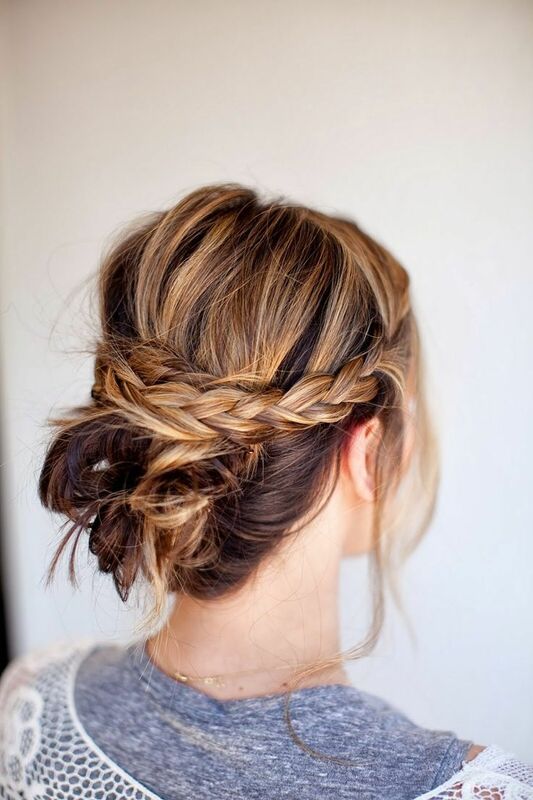 Donut buns are great, but they’re even better when combined with braids! Make a loose side braid and finish the style with a donut bun to create this unique look. 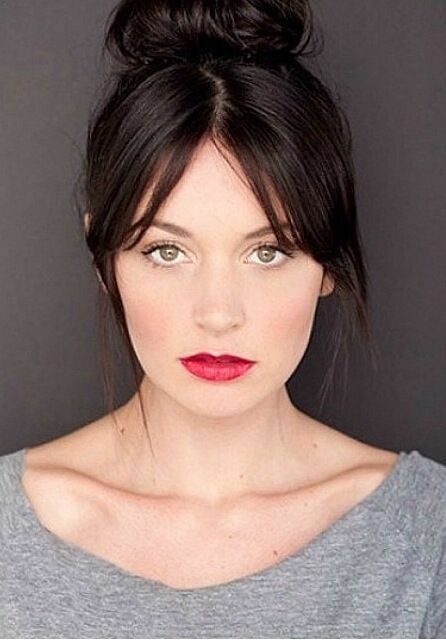 Cutting your bangs can be a great way to add some flare into your hairstyles. To make this one, just follow the instructions for the top knot, and finish by sweeping your bangs to the side. It’s not as complicated as it may seem! Start by making a high ponytail, but pull the hair band down a bit, so you can separate the hair on the base to create a hole. Pull the ends of the hair through that hole, and separate the loose parts in two. Wrap them around and fan out the bun, securing it with pins. You might say this one should be called the invisible bun! 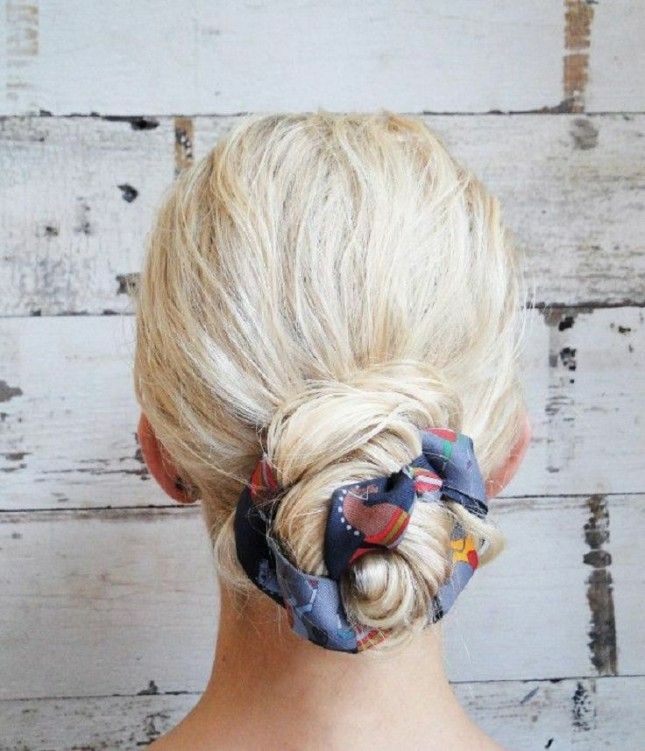 Many any bun you want and just wrap it in a scarf – you’ll look gorgeous! To create this unique hairstyle, make a ponytail and wrap it around a scarf. Tie the end with a hair band, and wrap it around the base of the ponytail. 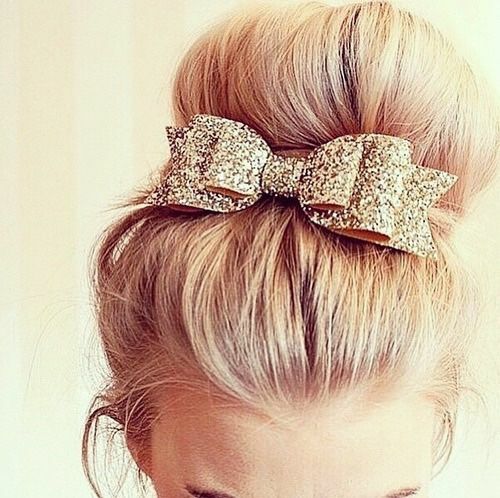 For a glamorous, and yet cute look, simply make a donut bun and decorate it with a glittery bow. You’ll look simply amazing! As you can see, there are so many different ways to make your hair look lovely in only a few simple steps. So the next time you find yourself thinking that you simply can’t afford the time, stop and ask yourself if that is really true.